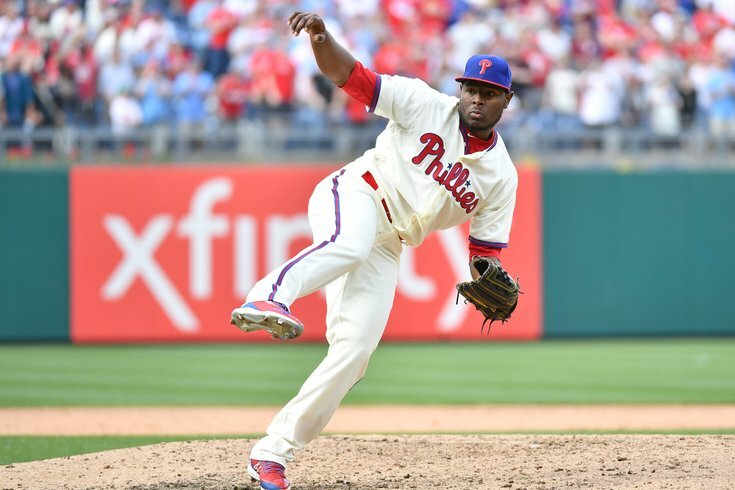 Hector Neris has found himself to be inconsistent when given important innings in relief for the Phillies this season. The Phillies bullpen is an issue. If you are reading this, you already know. Two of the Phils' three losses are directly the bullpen's fault. The unit also has seen six different pitchers on the mound for end-of-game situations in the ninth (or 10th) innings — both save and non-save situations. One can point the finger at manager Gabe Kapler, obviously he has really no sense of what the heck he wants to do with his bullpen at the ends of games (and last year nine different relieved recorded saves). But honestly, he hasn't had much to choose from this year. "I'd always love to see somebody emerge as a no-brainer option to close out baseball games," Kapler said on WIP Wednesday morning. David Robertson has barely been able to find the strike zone, while Hector Neris hurls it over the plate a bit too much. Seranthony Dominguez hasn't even had a chance to close out a game yet after some early struggles. Edubray Ramos gave up Tuesday's two-out, two strike game-tying home run in the ninth, while Jose Alvarez has an ERA of 20.25. Pat Neshek has been pretty impressive and reliable — but he did surrender a solo shot Monday that let the Nationals within one run (though he did collect his second save). Well, it's too soon to panic. With just 10 games in the books it is still very much possible that some kind of game-end structure will take shape and Kapler will get into a groove, as he has with the offensive lineup which has remained virtually the same thus far. If the struggles do continue, there are some reinforcements available within the organization. Tommy Hunter is on the 10-say disabled list and could provide a boost when he is healthy. Victor Arano is on the 40-man roster and has already tossed three scoreless innings in Lehigh Valley. Edgar Garcia is also relieving in Triple-A, is on the 40-man and has put together five solid innings, striking out six with just two earned runs. Austin Davis is a lefty on the 40-man roster, and has tossed 3.2 scoreless innings for the IronPigs. James Pazos, another lefty on the extended roster, has three scoreless innings in his ledger as well as an impressive fastball. And, of course, Craig Kimbrel remains unsigned and has 333 career saves with a 1.91 ERA over nine MLB seasons. He'd be an obvious and gargantuan upgrade for the Phillies current staff. Don't be surprised if the pen works with a revolving door for much of the season as the team tries to figure out how the heck to put together the best eight-man bullpen. In terms of both bullpen ERA and opponent batting average, every team in the division slates in the bottom 12 (of 30 MLB teams). They have combined to blow 12 saves in 21 opportunities and have allowed 36 home runs — all while somehow pitching below the league average of 40 innings of relief per team (through Wednesday afternoon). This is the new normal for baseball. Back when the Phillies were competing for World Series titles, there really were only two relievers that mattered — setup man Ryan Madson and closer Brad Lidge. In the decade since, starters are pitching fewer innings and therefore not going as deep into games, and bullpens have taken on an even more important role. It will be extremely interesting to see how the Phillies solve their bullpen issue — or how they are able to overcome it in the coming weeks and months. One thing is for sure, Gabe Kapler — now blessed with one of the most dynamic and potent line ups in baseball — will likely find himself judged almost completely on his management of the pitching staff and bullpen as his second season continues with the highest of expectations and stakes.